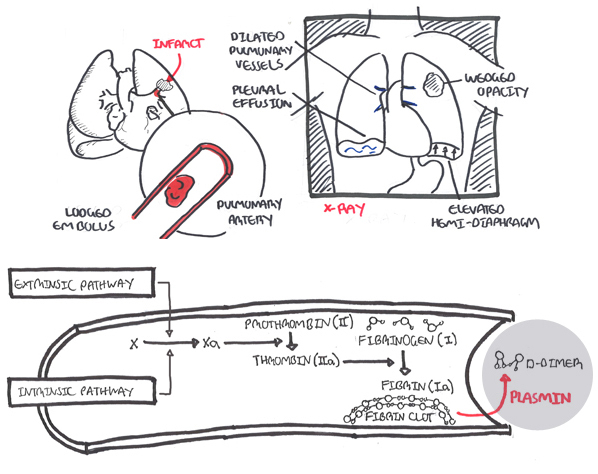 Summary of Pulmonary Embolism The mortality of diagnosed and treated PE is 7%. Many more people die from undiagnosed PE. Most patients present with dyspnea +/- chest pain. 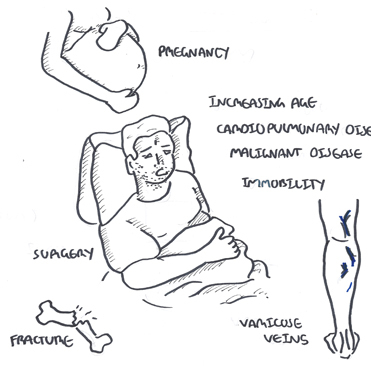 The main risk factors is the development of DVT from immobility; surgery, pregnancy, chronic disease, increasing age. There are two forms of imaging for PE: CT pulmonary angiography and V/Q scanning. Other investigations include bloods taking a d-dimer test. 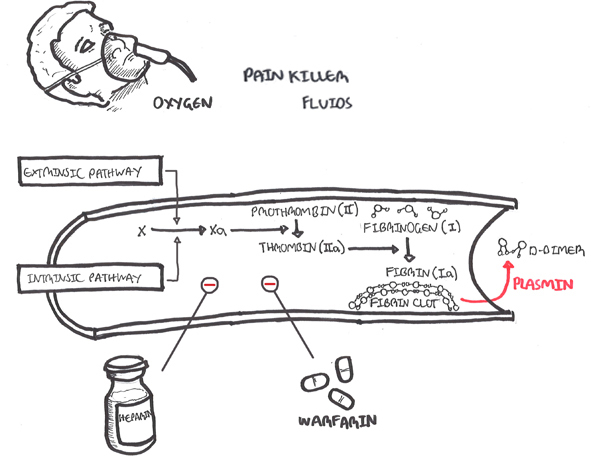 General treatment includes IV heparin followed by oral warfarin therapy. 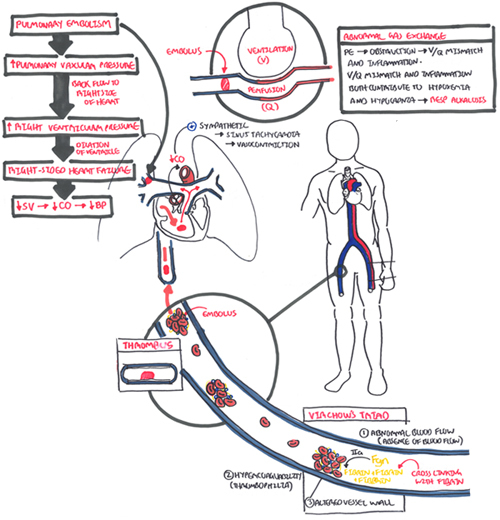 For massive (serious) PE thrombolytic therapy is initiated. 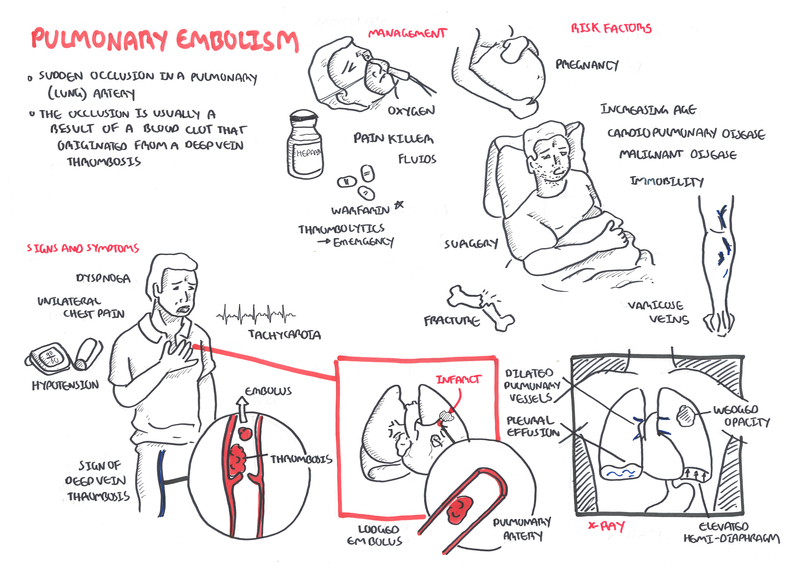 Overview Pulmonary embolism occurs most often from a dislodged thrombus from the lower limb (DVT). 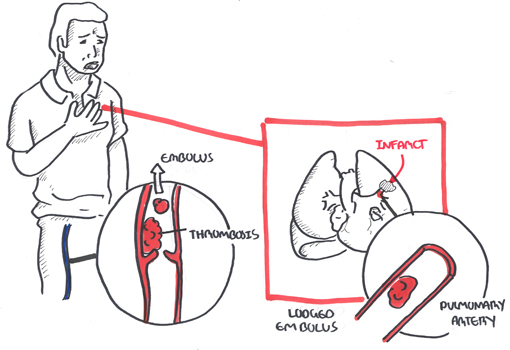 The embolus travels towards the lung and becomes lodged in the pulmonary artery resulting in infarction of the lung tissue. Deep Vein Thrombosis (DVT): Blood clot in the deep venous system that usually affects the lower extremities or pelvic veins. Pulmonary Embolism usually arise from Deep Vein Thrombosis (DVT). DVT is the most common in patient over 40 years of age who undergo major surgery. Clinical Presentation Most patients with PE experience dyspnea commonly without other symptoms. Syncope, cyanosis, angina are signs of massive PE. 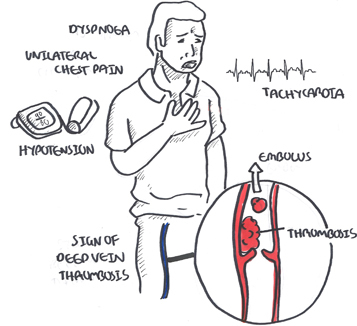 Unilateral pleuritic chest pain is experiences in minority of patients +/- haemoptysis. Signs and risk factors for DVT is extremely important during history and examination. Investigations Radiologic studies are critical in the diagnosis of PE and DVT. A normal or near-normal chest x-ray is the most common finding in PE. Classic abnormalities associated with PE include Westermark sign (nonspecific prominence of the central pulmonary artery with decreased pulmonary vascularity), Hampton hump (peripheral wedge-shaped density above the diaphragm), and Palla sign (enlargement of the right descending pulmonary artery). D-dimer is not specific for DVT, but can help in ruling PE out. PE is incorrectly diagnosed in almost 75% if patients. Acute onset of dyspnea or hypoxemia with a normal chest x-ray should be considered a pulmonary embolism until proven otherwise. Emergency Pulmonary Embolism If patient is haemodynamically unstable, emergency pulmonary embolectomy should be considered. In patients with large PE and no contraindications, thrombolysis is the definitive management.